Q: We have noted that Premier Li Keqiang is on a visit in the Netherlands. Yesterday, the leaders of the two countries held talks and jointly met the press. The Netherlands said that under the current circumstances, it is willing to join hands with China to improve the multilateral trading system and promote free and fair trade. Can you give us more details in this regard? A: Just like you said, Premier Li Keqiang of the State Council is on an official visit in the Netherlands. Yesterday, Premier Li Keqiang and Prime Minister Mark Rutte held talks, jointly met the press and witnessed the signing of cooperation documents between our two countries. His visit is still underway and please keep following it. Firstly, China and the Netherlands will continue to open wider to each other. Our two sides agreed to deepen cooperation in such traditional areas as agriculture and energy and expand cooperation in high-end manufacturing, services sector and other new areas. Premier Li Keqiang reiterated that China is willing to create a market-oriented, law-based and international business environment for all countries and enterprises of various ownerships. The Dutch companies are welcome to expand their investments in China and share the dividends brought about by China's new round of reform and opening up and high-quality development. Secondly, China and the Netherlands will stay committed to upholding multilateralism and free trade. Our two sides agreed to carry out more open practical cooperation to jointly safeguard multilateralism and free trade and send out the positive signal that China-Netherlands and China-EU relations are committed to upholding the rules-based international order and promoting trade and investment liberalization and facilitation. Prime Minister Mark Rutte also stressed that under the current circumstances, the Netherlands is willing to work with China to improve the multilateral trading system, promote free and fair trade and uphold the rules-based multilateralism and free trade system. Thirdly, China and the Netherlands will join hands to address the common challenges facing mankind. The two leaders exchanged views on international and regional issues of mutual interest and agreed to step up cooperation in tackling climate change and aging population and address the common challenges facing mankind. I would like to stress that China stands ready to work with the Netherlands to take Premier Li Keqiang's visit as an opportunity to further deepen political mutual trust, expand practical cooperation, and maintain the sound and steady development of the open and pragmatic partnership for comprehensive cooperation between the two sides so as to make greater contributions to peace, stability, development and prosperity of the region and the world at large. Q: Recently, there have been frequent high-level exchanges between China and Pakistan. How does the Chinese side look at the development of China-Pakistan ties since the formation of the new Pakistani government? A: China and Pakistan are all-weather strategic partners for cooperation. In recent years, our bilateral ties have been operating at a high level. Since the formation of the new Pakistani government, China-Pakistan relations have maintained a sound momentum of growth. You may have noted that President Xi Jinping and Premier Li Keqiang have sent messages of congratulations to the new Pakistani President and Prime Minister respectively and that the two prime ministers also had a telephone conversation. State Councilor and Foreign Minister Wang Yi visited Pakistan immediately after the new Pakistani government was formed. Going forward, there will be more high-level exchanges between the two sides. Steady progress has been made in the China-Pakistan Economic Corridor and practical cooperation across the board. Cultural and people-to-people exchanges have also become more frequent. Our two countries maintain good coordination and cooperation on major international and regional issues. We are convinced that with the concerted efforts of our two sides, China-Pakistan ties will continuously make new headways. Q: The maritime exchanges between China and the Philippines have received considerable attention. Do you have any update on the China-Philippines Bilateral Consultation Mechanism on the South China Sea? A: Under the personal care of the leaders of the two countries, China and the Philippines officially set up the China-Philippines Bilateral Consultation Mechanism on the South China Sea (BCM) in early 2017 which restored the settlement of the relevant maritime issue to the right track of negotiation and consultation. The two sides have been using this platform to properly address differences, prevent and manage maritime accidents and promote practical maritime cooperation, which has achieved positive outcomes. 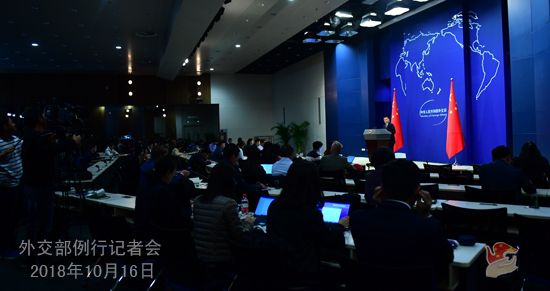 As agreed by the two sides, the third meeting of the BCM will be held in China on October 18. Chinese Vice Foreign Minister Kong Xuanyou and Philippine Undersecretary of Foreign Affairs Enrique Manalo will separately head a delegation to attend the meeting. Representatives from national defense, natural resources and environmental protection, fishery, transportation, energy and coast guards departments of the two sides will also participate in it. The two sides will exchange views on the current situation in the South China Sea as well as respective concerns and discuss practical maritime cooperation including joint exploration of oil and gas in the sea. The Chinese side believes that the successful convening of this meeting will make positive contributions to the sound development of China-Philippines relations and peace and stability in the South China Sea. Q: What is China's position towards the Saudi Arabian journalist Jamal Khashoggi's disappearance? A: We have noted relevant reports. We know that the relevant parties are conducting investigations. Q: In a recent address, the US leader accused China of "militarization" in the South China Sea and "reckless harassment" on a US warship which was conducted "freedom-of-navigation operations" in the South China Sea. Do you have more comments on this? A: These remarks by the US side is nothing but blame-shifting. China has indisputable sovereignty over the South China Sea islands and their adjacent waters. Like what any other country in the world does, China's peaceful construction activities on its own territory, including the deployment of necessary national defense facilities, is the exercise of its right of self-preservation and self-defense as a sovereign state in accordance with international law. It has nothing to do with "militarization". There is no problem at all with the freedom of navigation and overflight in the South China Sea. In recent years, the US side has frequently sent warships and military aircraft close to Chinese islands and reefs in the South China Sea under the pretext of so-called "freedom of navigation and overflight" and even trespassed into the territorial waters of China's Xisha Islands. Those are behaviors that create tension and "militarization". As to their allegation that their warship was "recklessly harassed" by the Chinese military vessel, the Spokesperson of the Chinese Ministry of Defense has talked about what truly happened. The US warship travelled all this long way to make trouble at China's doorstep, but in turn accused the Chinese military vessel of "reckless harassment". Such logic is extremely ridiculous. 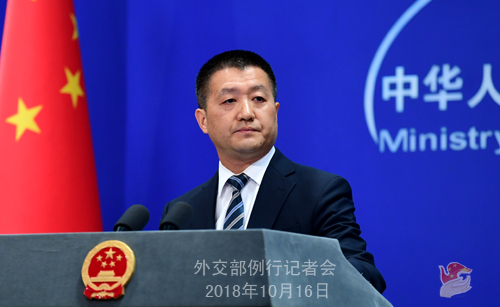 We urge the US side to stop stirring up troubles and creating tensions, respect efforts made by countries in this region to resolve the issue through negotiation and consultation and uphold peace and stability in the South China Sea, stop undermining China's sovereignty and security interests, and be a contributor to peace and stability in the South China Sea rather than a destroyer. Q: Do you have more information on the possibility of a meeting between President Xi Jinping and President Trump during the G20 Summit in Argentina at the end of November? A: I have taken similar questions recently. China and the United States have maintained communication on dialogues and exchanges at all levels. Q: It is reported that the Russian Orthodox Church has severed its ties with Constantinople. What is your comment? A: I am not aware of the specific situation at this point. I will reply to you after I check on the relevant information. Q: Ambassador Cui Tiankai gave an interview to Fox News on Sunday. He expressed that it was very difficult to understand what President Trump's intention was in this whole trade conflict with China. Is China looking for other ways to try to get a better understanding? Is there any way to get through this sort of "wall of misunderstanding"? A: The relevant statements made by Ambassador Cui Tiankai in his interview with Fox News explicitly expressed China's position and expectations regarding the current problems in China-US relations. We are two major countries. When we maintain sound interactions in such areas as politics, security, economy and trade, our two peoples will certainly stand to benefit, as evidenced by what happened over the past four decades or so of diplomatic ties. 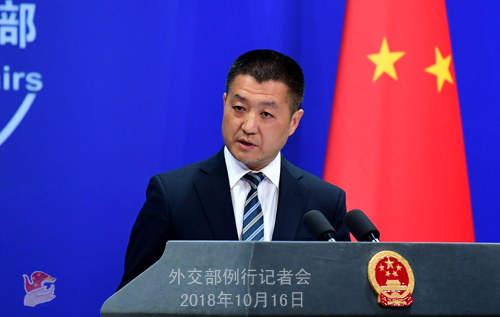 The Chinese side always believes that China and the United States should promote a sustained, sound and steady development of bilateral ties on the basis of non-conflict, non-confrontation, mutual respect and win-win cooperation. However, this requires efforts not only on the Chinese side, but also on the US side. In particular, when it comes to addressing certain problems in bilateral relations, we hope that the US side could observe the important consensus reached by our leaders during all the top-level meetings and demonstrate mutual respect, equality, good faith and seriousness. We believe that only dialogues on such a basis can deliver positive outcomes.